Mondah Mor forms the head wall of Glen Geusachan with its steep rocky E slopes. It has two tops of similar size, the more northern being higher by 3m, but neither is a distinct peak. 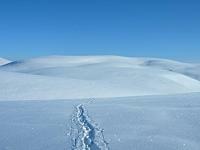 To the S are gentle slopes over featureless moorland leading to Glen Geldie. 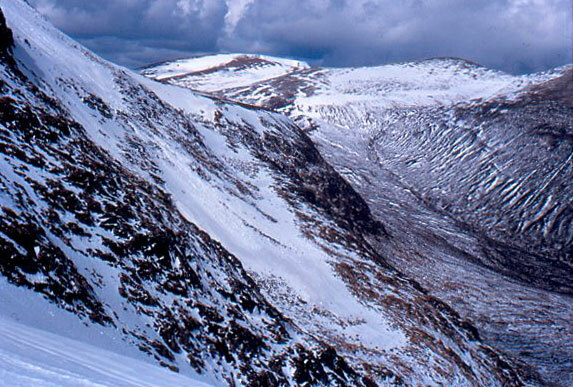 To the N a ridge with moderate to gentle slopes leads to the plateau of the Moine Mor, from where tracks lead to Glen Feshie. A descent NNE towards Loch nan Stuirteag then SSE by the Allt Clais an t-Sabhail leads into Glen Geusachan. 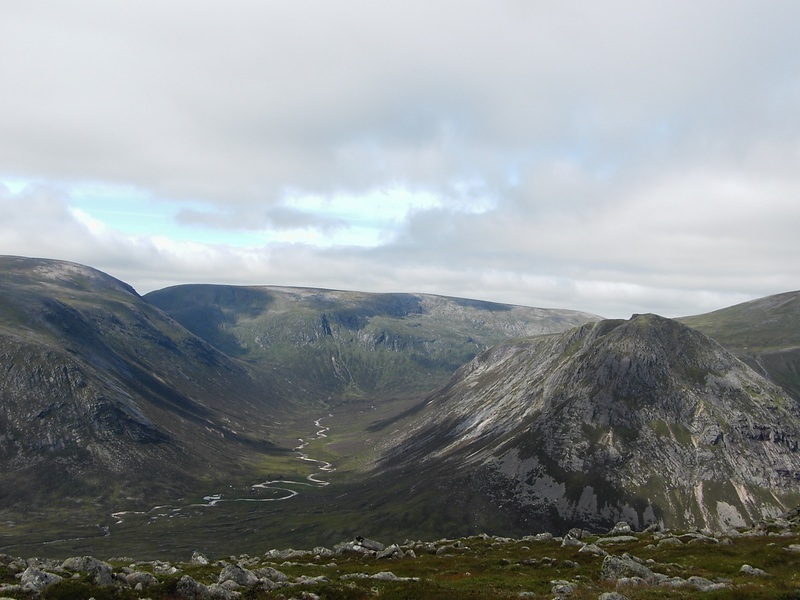 2km W of the summit lie the steep craggy slopes of Leth-chreag overlooking Glen Eidart. 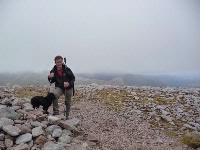 Mondah Mor is normally climbed with Beinn Bhrothain via the col at the head of Coire Cath nam Fionn. 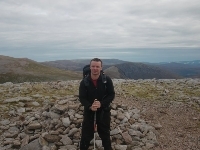 The summary information of one or more ascent routes that include Monadh Mor. 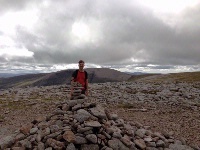 2 1290 m 35.47 km 9.5 hrs Beinn Bhrotain and Monadh Mor Long route on mixed terrain in the Cairngorms. 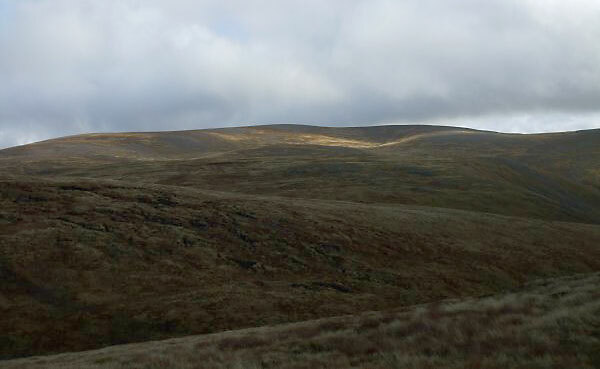 Easy going on tops, but partly over featureless high moorland, so navigation will be difficult in low visibility. Cycling on the initial approach will reduce the time required for this walk. The Wee Black Dug at the summit of Monadh Mor, after an enjoyable - if lengthy - tramp from Auchlean. August 2011. Post a few words about Monadh Mor or read what others have had to say. 11th July 2007. 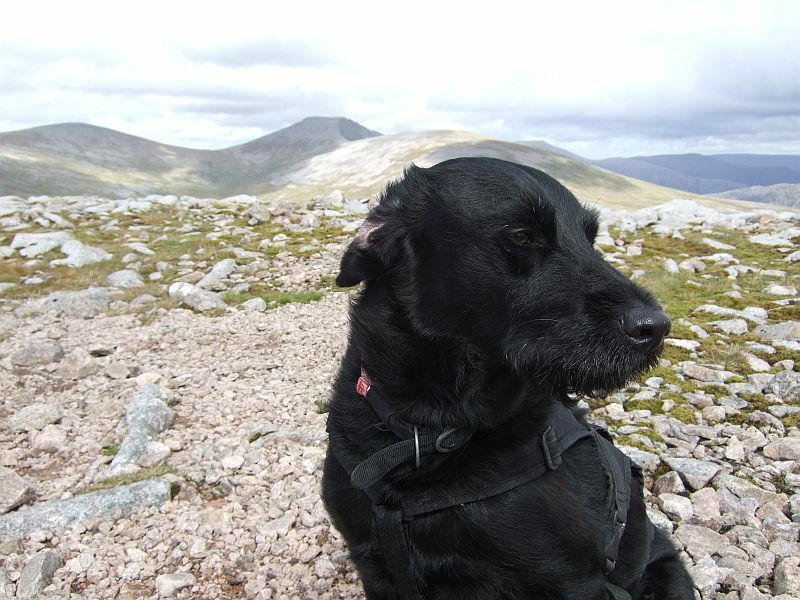 We started at the Glen Feshie car park, 1 km north of Achlean, climbed to a point south of Carn Ban Mor and dropped down to the Allt Sgairnich. After following the path downstream for about 300 metres, another path leads off to the left towards the col at 876 metres and over the top of Tom Dubh. The Allt Luinneag is most easily crossed by fording the two streams which flow into the junction at 925 955, using partly submerged stones.